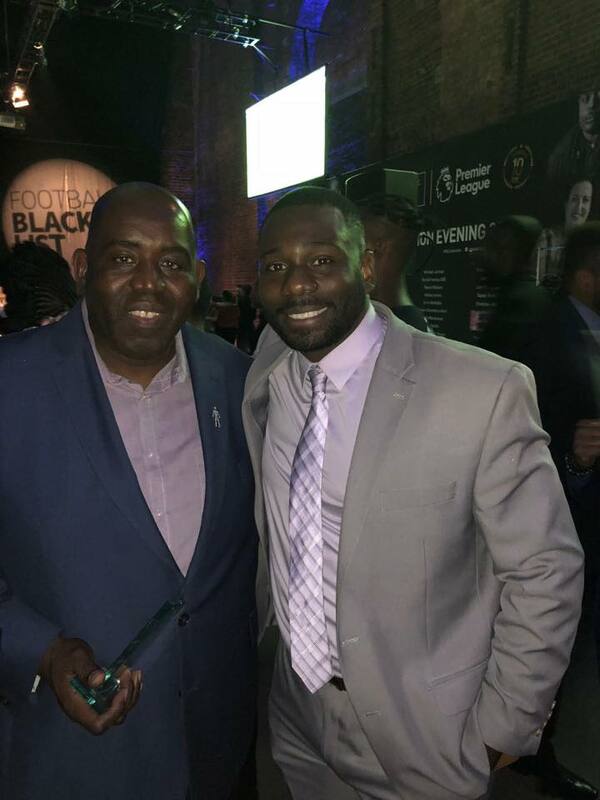 Invited by Pitching it Black’s Founder Eugene Allen, BSMA Chairman and CEO Justin Reid traveled 4,000 miles across the pond to London, England to attend the Football Black List this evening. FBL which was founded by Leon Mann and Rodney Hines in 2008, celebrated 10 years of existence with over 400 guests that included Chelsea FC Legend Jimmy Floyd Hasselbank, Brighton & Hove Albion Manager Chris Houghton, Arsenal Fan TV Founder Robby Lyle, West Brom Manager Darren Moore, England Women’s national team legend Alex Scott, and many more Black players, coaches, and administrators who have impacted the Premier League for nearly 30 years. The event was a celebration of English footballers, coaches, and media both current and past. Awards for the event were given to not just one individual for a category, but a handful of individuals who have made an impact in the Community & Grassroots, Coaching & Management, Media, Administration, Commercial, as Practitioners, and ones to watch in the future. 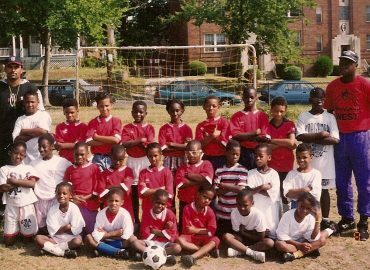 Under-representation of Africans and the Caribbean in English football is a similar issue to the United States. Black players in the Premier League make-up 25% of the league, similar to Black players in Major League Soccer who total 31%. Yet, similar to the US, in other roles such as Manager and General Manager, Blacks remain under-represented. In MLS, there are currently zero Black head coaches of the 23 soon to be 25 teams in the league. In the Premier League of the 20 teams, there are currently only two Black head coaches, Houghton and Wolverhampton Wanderer’s FC Nuno Espírito Santo. During the Premier League Chairman and CEO Richard Scuddymore’s speech, who will be relinquishing his role as CEO, an attendee shouted out “Rooney Rule”. A rule that the National Football League has used for over 10 years and has seen an increase in the number of Black head coaches in the league with 70% of NFL players being Black. The implementation of the Rooney Rule has been an ongoing discussion across all sports in the US, and one that leagues will eventually have to adopt in the interest of improving social awareness and social impact in a country since the 2000s seems to be more divided than ever. To help address this and pay tribute to those in influential positions – the Football Black List shines a light on those who are inspiring the next generation to consider other roles in the sport. Household names and highly respected people from the industry including – Rio Ferdinand, Dame Heather Rabbatts CBE, Yaya Toure, Hope Powell CBE, Lord Ouseley and Rachel Yankey OBE – have all featured on the list. They have been highlighted for their efforts away from the pitch, not their achievements on it. We believe by highlighting role models – working across a wide range of positions in football – young people will be more encouraged to think about how they can get involved in the sport beyond the field of play. The initiative, which has been supported by The FA, Premier League, Professional Footballers Association and Kick It Out, also provides an opportunity to reflect on how diverse the football industry is, discuss the under representation of people from African and Caribbean backgrounds – and, most importantly, how to address this issue. Vitally, the Football Black List also pays tribute to individuals making a difference within the community and at the grassroots level of the game. The list is published exclusively in The Voice Newspaper every year to ensure it is rooted in the African and Caribbean community and has received widespread mainstream coverage across the UK on the BBC and Sky Sports, as well as in The Guardian, The Times, The Daily Mirror, The Daily Star and Independent. Football Black List hosts a celebration event each year to celebrate those on the list. The last three events have been held at the Village Underground in Shoreditch and it has previously been held at Wembley Stadium twice, as well as the House of Lords and the London Olympics HQ.